As a kid first discovering graffiti in the late 80's and early 90's there were only two writers that caught my attention and introduced me to the possibilities of spray paint through art that popped up over night... Snow was one of them. I once had the opportunity to hang out with Snow in his home/dojo and based on my experience I can imagine what's in this book. Snow is a genius not just with paint but with words and overall philosophy. I have a huge respect for him and his history and that's why I believe we should all have this book in our knowledge libraries. Its because of Snow that I just don't jump to cutting your head off like I used to.... Now I let you know I have Hanzō sword on my person... The rest is up to you. Salutes to my big brother Snow! 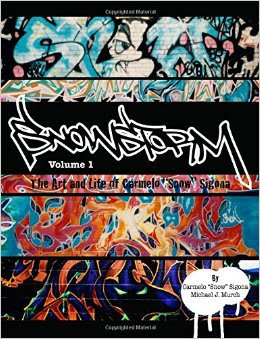 The inspirations and struggles of the infamous New Jersey graffiti artist Snow. This volume showcases some of Snow's earliest works, his brushes with the law, his travels, and his humble beginnings as a professional artist. Catch a glimpse of some of his rare and never-before-seen images! Video: Cannibal Ox - "Harlem Knights"